This page sort of speaks for itself, doesn't it? We'll have to bug Kevin to get the rest of the story. Here, Kevin is in a uniform he wore before he joined the Marines. 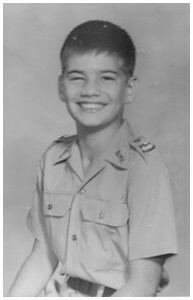 To my regret, I let him be enrolled in San Marcos Military Academy in 1968 - I say to my regret because I came to realize that he hated the joint, although he's not letting on in this picture. At least he got to play some football while he was there.